First off, this is a few days coming: a big congrats to Courtney who won the 80’s TV trivia contest for a $30 iTunes virtual gift card!Â She got ALL the answers right to the Marmalade Birfday Trivia Extravaganza (ok, so it was just a contest but I need to hype it a bit). 1. What was Reverend Jims real last name on TAXI? 2. What was the name of Arnold’s fish on Different Strokes? 3. Who shot J.R. Ewing? 4. Who palyed Mork from Ork’s son? Â 6. On Three’s Company, what city did the trio live in? Yesterday we had our first taste of real snow falling on the ground here in the Midwest.Â My girls went outside to play and I had to haul all the snowstuff / snow wardrobe out from the top shelf of the coat closet in our mud room.Â There has got to be a better way of organizing, I tell you, I’m about to go all Henry David Thoreau on the people in this house (well minus the tuberculosis infection).Â Simplify simplify simplify.Â I so want to do this–funny that it coincides with boxes upon boxes being present in my living & dining rooms for client images.Â Funny how I get this urge during the busiest time of the year RIGHT before our home gets inundated with boxes from Santa and well meaning family. Speaking of Santa—we got to see him on Saturday night!Â The girls were so excited, he appeared in the Holiday parade put on by the downtown merchants’ association of Wilmington.Â I love seeing all the storefronts lit up with twinkle lights, the street lights with the lit up wreaths.Â The parade was a blast and we stuck around all day to see the crowds milling about the downtown area near the Marmalade Studio.Â I was sorry I missed out on the afternoon tea at the local bed & breakfast.Â I feel bad because I forgot my brand spanking new point & shoot camera that I bought myself for my birthday (a Canon Powershot A570 IS for anyone who is interested (the Amazon link is a full $20 less than I paid.Â Darn it. )Â I liked it because when it comes time to hand down to my 7 year old I won’t feel horrid that I’m handing down an uberexpensive camera but one that was reasonably priced and that comes with loads of features…I’m really impressed with this little thing and am busily annoying the heck out of my family snapping photos without worry about hauling out the “big guns”).Â Of course I bought the new camera to put in my hand bag, um, yeah, didn’t work out for me on Saturday as the camera sat in my office at home gathering dust!Â LOL.Â Nonetheless it feels good to be back amongst the land of those who snap for the pure pleasure of taking photos.Â Perhaps now I can start documenting our lives again (like I did before the business took over my mindset). Lastly, may she rest in peace.Â Our cat, Twin(kie)…one of our very first babies, passed away on Saturday.Â We came home from the festivities to find that her sweet life has come to pass.Â We are in a state of grieving here at the Marmalade home.Â The girls and I wrote little letters and took an old snapshot of her and put her to rest in our backyard yesterday morning.Â It was very sad…the girls and I are having a tough time grieving.Â She was a sweet sweet soul who spent much of her life purring away, even towards the end she was just an armful of purrs and love.Â We loved you sweet girl, we hope the afterlife is filled with lots of Pounce treats and feathers on sticks to bat at. 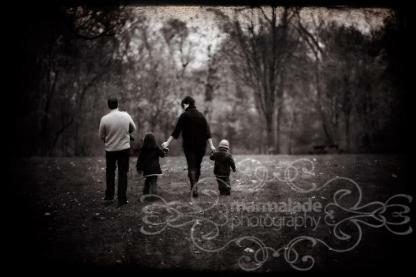 To that end…thank you for stopping in.Â It’s a post with no images, I don’t want to muddy the waters here with grieving and happy shots of families frolicking in Marmaland.Â Peace, love and joy to your family during the wind up of the holiday season. I am sorry to hear of your loss.. its funny how our pets become such a huge and important part of our lives and how much thier absence is noticed.. So my thoughts go out to you and your girls today.. its sounds as though she was very loved.. and gave much love in return and thats what counts… the love.. Sorry about your little furry one! I hope she is doing all the things she loved now. Enough of this – it is tooooooo much! The winner will receive a virtual gift certificate to iTunes. I’ll be doing this in trivia form, very appropriately 80’s themed TV trivia. If there is a tie I will then draw a name out of a hat! So please, enter, enjoy. Have fun reliving the 80’s in TV pop culture. 1. What was Reverend Jims’ real last name on TAXI (all these years I thought it was something else)? 3. Who actually shot J.R. Ewing? 4. What actor played Mork from Ork’s son? 5. Can you name the 5 original MTV VJ’s? 6. On Three’s Company, what city did the trio live in? Hi i was wanting to know what kind of actions you use on your pictures or if you use any at all. I am a true admirer of your work. Thank you for your time! Be on the look out because tomorrow is the big 3-7 for you-know-who. Remember…I’m going to give a gift away for MY birthday to some lucky reader! …last session for 2007! Yes, I am excited because it truly ended on a high note. 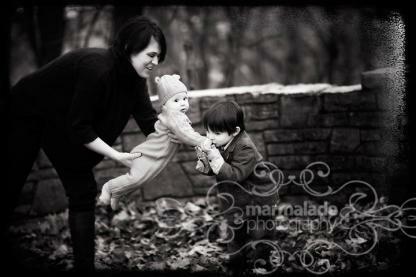 I want to thank Maryfran and Michael for having me out to Winnetka today to photograph their three gorgeous kids. 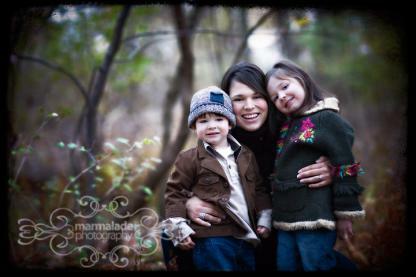 And I’m not kidding you…gorgeous kids is not an understatement. To boot their family was beyond gracious, sweet and fun. I adored meeting them (finally) and a big thank you to KC’s mom for the referral. So to M, J and N…thank you for being such great sports and hanging out with me while I played the role of photographer… I had a blast getting to know all of you. Scroll down for sneak peeks. p.s. TOLD YOU ALL I love November light. It might be right up there with September & May in my book. looks like this was a great session and great location to boot too! Good for you and your client!